You can do it! 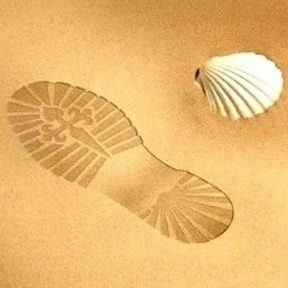 With this pretty charm bracelet featuring soft golden-yellow-coloured Citrine gemstones for positiveness, and the concha shell of the Camino de Santiago for life's journey, anything is possible - especially when travelling the world. Dimensions: Bracelet measures approx 18.5cms (7.5") in length with a 3.5cms (1.25") extender chain finished with a citrine stone. This bracelet would make the ideal gift for travellers, and new journeys in general (like starting something new . . a new beginning) and so also work situations like starting a new job too (or starting at university) because it is thought to bring positiveness and success. 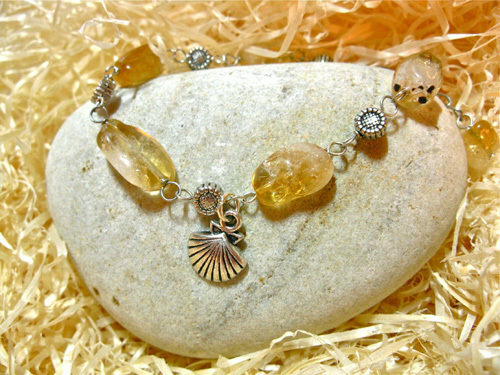 This pretty, unique citrine bracelet speaks of adventure. It comes gift-wrapped, like all our presents - and we can print a personal message on your behalf. Citrine is believed to harbour many emotions but is predominantly known as a "Success stone" - said to enhance creativity and stamina. It has also been said that Citrine helps to manifest goals, and attract abundance and prosperity. More information about Citrine . .